Inaugural F3 On-line Auction a Huge Success! 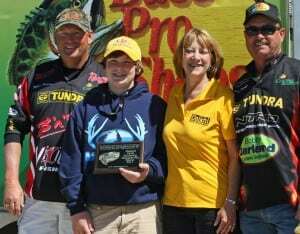 Bass Pro Shops, Crappie Masters Tournament Trail held its second annual National Youth Scholarship at the Alabama River. Dallas Godshall of Prattville, Alabama represented the Future Fisherman Foundation in the 13-15 age groups. Godshall was just one of the youth anglers fishing for prizes including a $4,000 scholarship. Crappie Masters offers free youth fishing events for local children at each of their tournaments, culminating with the National Youth Championship. The Future Fisherman Foundation chose to select a student from one of their angling education programs to enter the tournament. Doug Darr, the Aquatic Education Coordinator for the AL Dept. of Wildlife and Freshwater lead Hooked on Fishing Not on Drugs and WFF Partnership program in the Montgomery area. Graduate, Godshall passed the course with excellence and Dallas won the groups fishing contest. Dallas partnered with pro anglers Whitey Outlaw and past Crappie Masters champion, Mike Parrot. It would be his first time to fish for crappie. Godshall caught two crappie weighing in at 2.72 pounds. Dallas is looking forward to using his new skills on his next fishing trip. The Foundation would like to thank Crappie Masters, the pros, the Morgan Family, and Bass Pro Shops for including F3 anglers in their tournament this year. In addition to the prizes, the youths took home fond memories of fishing on Alabama River. Each child looks forward to the possibility of fishing in next year’s tournament. Established in 1986, the Future Fisherman Foundation unites the sportfishing industry and a nationwide network of state outdoor educators, national conservation groups and youth organizations dedicated to introducing America’s youth to angling and the outdoors. These efforts help people of all ages have safe and enjoyable fishing experiences that foster conservation ethics. Visit www.futurefisherman.org.